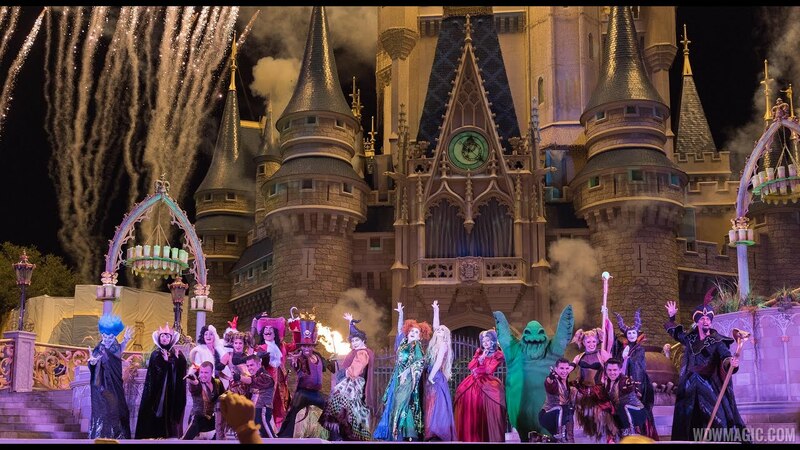 Sep 16, 2015 in "Hocus Pocus Villain Spelltacular"
The 22 minute castle show sees the mischievous Sanderson Sisters from Disney's “Hocus Pocus” return to the mortal world for one night during the Halloween season. With only a few hours to run amuck, the three sisters decide to use their magic to throw the best evil Halloween party. “Hocus Pocus Villain Spelltacular” features appearances by Dr. Facilier, Oogie Boogie, Maleficent and other great Disney villains, along with dancers, projections and special effects that combine to make this new show the highlight of Mickey's Not-So-Scary Halloween Party. There are four opportunities during each party night to see the show, with showtimes at 8pm, 9:20pm, 10:40pm, 12am. Learn more about this year's Mickey's Not-So-Scary Halloween Party. We've got a video from the opening night performance of Hocus Pocus Villain Spelltacular - check it out below. More from "Hocus Pocus Villain Spelltacular"